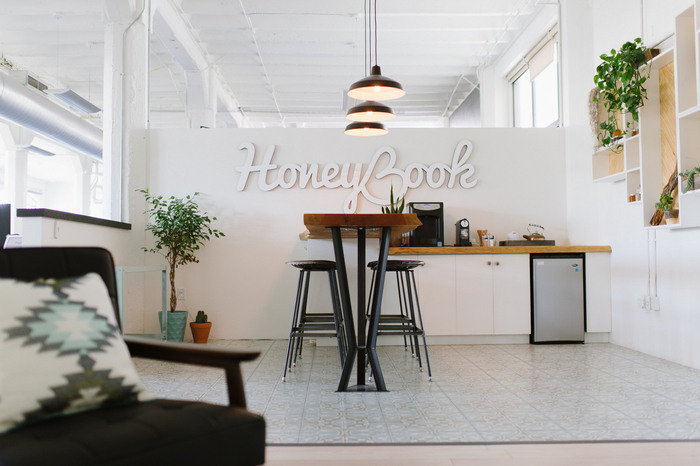 Eran Dayan Design and Aynav Mor developed the new office design of event planning platform Honeybook located in San Francisco, California. HoneyBook hired Eran Dayan Design with Aynav Mor to bring their vision of a non-traditional office to life. The open 15,000 square foot office is now a place that feels more like a home/events space/coffee shop/wine bar than an office. The office originally didn’t have a lobby, so we created one. Hardwood floors, custom floor to ceiling steel shelves, a concrete reception desk and a cafe area define the space. To divide the open floor plan, we created four different living and dining room settings on one side, and put desks on the other. Not only do these areas provide a change of scenery throughout the workday, they also seamlessly promote collaboration. A place to both meet and eat as a company was important to us, so the kitchen area was a big focus. To create a unique space to host events, we brought the outside in with an indoor deck. Market lights were hung from the ceiling, deck flooring was installed, and we designed the space with hanging swings, picnic tables and a succulent filled HoneyBook sign. Combined with our kitchen and bar area, it’s a perfect place to host an event.